On Friday the dogs and I took our training on the road, to the Escambia County Equestrian Center. On Friday the dogs and I took our training on the road, to the Escambia County Equestrian Center. The County was working hard to prepare for an upcoming horse show, maintaining the grounds, preparing the stalls and numerous warm-up rings. It was early so I was able to find an out-of-the-way shaded corner to use for an hour of dog training. The main, covered arena was immaculately raked and leveled. A water truck drove near my car; the driver stopped to make adjustments to his truck. The water he would spray over the surface of the dirt arena would keep the dust down during the horse show. Surrounding my car were numerous piles of horse droppings, hay and dirt, perfect for distraction work. If the dogs can work in that environment perhaps a pristine indoor show ring wouldn’t be too much of a challenge. Levi is a seasoned traveler. He is rarely tempted by horse droppings, lawn mowers or water trucks. Would the Equestrian Center smells tempt him away from his Utility scent articles? I set out five metal and five leather articles. He worked the scent pile for several seconds, looking for the correct leather article #4. When Levi can’t identify the correct article within the first five seconds he becomes frantic and starts picking up any article. He finally found #4 but only after picking up three wrong articles. Interesting that he knows he has the wrong one in his mouth, comes back halfway, spits it out and finally returns to the correct article. The metal #4 was easier for him. He ran out and immediately found it, proud of himself and anxious for a reward. We continued to work on heeling, signals, and retrieving. Levi is still shy of two “legs” towards his Versatility title, which requires him to perform two exercises from the Novice, Open and Utility classes. I need to keep his basic training sharp as well as the Utility training. As long as Levi gets an intermittent game of “catch the tennis ball”, he is happy to keep working. It was time to work puppy Catcher. He jumped out of the car and quickly found some manure to eat. An energetic dog with an appetite for road apples, close to the ground, is quicker than me at 5’4” standing over him. I was frustrated already, a few minutes into our training. He played with his toy, worked beautiful finishes and heeling with the water truck idling nearby. Good dog. I mentally patted myself on the back. Darn I’m a hot trainer! (That’s always when things go downhill.) Retrieving and go-back work was less successful. Catcher wanted to meet the truck driver, who ignored him, so he again eyed the horse desserts. Although I continued to train Catcher in spite of these distractions, it was clear I needed to stop and train the one command that is lacking in my training bag, that is, “Leave it”. Obviously if we are to return to this location and actually train for the obedience ring, Catcher needs to be able to concentrate on me and not his stomach. As he reached for another road apple, I said, “Leave it”, and gently pulled on his collar. The goal is for him to turn his head away from the distraction and look at me for a food or toy reward. It only took a few minutes before Catcher saw the wisdom of complying with my training, which does not mean that the problem is licked, so to speak. But at least he can understand over time that eating pungent road apples will make the old lady unhappy, always. Such is the life of an obedience show dog. I remember at the same location over a year ago giving Levi the choice of retrieving manure or his dumbbell. He made the wrong choice. But it gave me to an opportunity to clarify that he was wrong. With this training he went on to earn his Open title, which won him many toys and cheese treats. The dogs have to learn that if the old lady is happy then they will also be happy. Eating road apples bad. Ignoring road apples good. PS: this command also goes for dead animal parts, cats and food on the table, etc. Sigh. 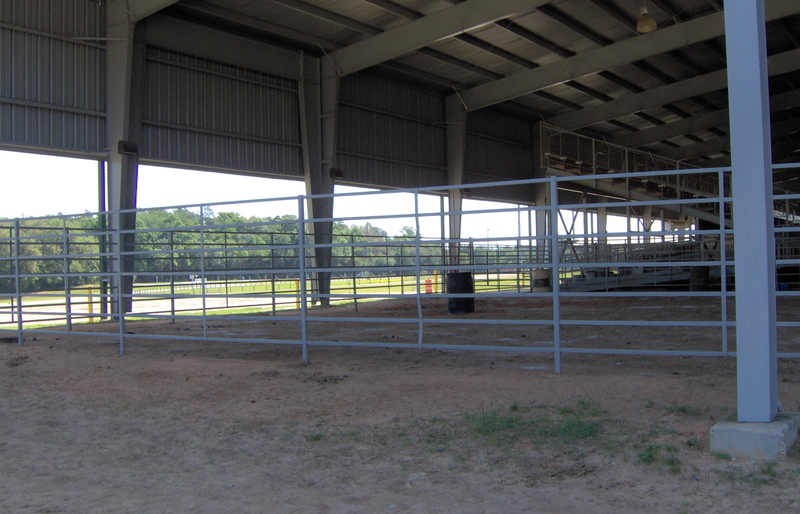 A holding pen for sheep, cattle and horses, a perfect Utility training ring. 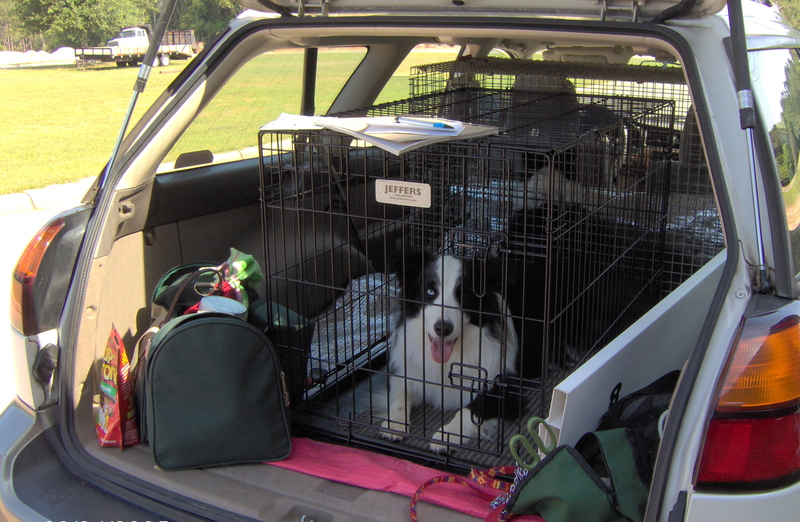 This entry was posted in border collies, Dog training, Retirement Life and tagged Escambia County. Bookmark the permalink.